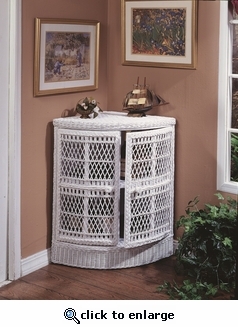 A great space saver for that unused corner in your den or family room. This cabinet has two see-through woven lattice doors and ove interior shelf. Perfect for storing wine bottles and glasses. Hand-woven of natural wicker over a wood frame. White finish.